Mono County’s Eastern Sierra and surrounding region offer an abundance of extremes – the country’s highest and lowest points in the lower 48, the oldest trees and newest mountains. A land of sun and snow, Mono County averages 277 sunny days a year, with a summer average high of 79 degrees Fahrenheit and a winter low of 13 degrees Fahrenheit accompanied by an average of 47 inches of snow. A road trip is the perfect way to connect many of those dots, either going north or south along state-designated Scenic Byway, US Highway 395, which is strung together by amazing scenery and countless adventures along the way. A road trip – either going north or south along state-designated Scenic Byway, US Highway 395 – is the perfect way to connect many of those dots, which are strung together by amazing scenery and countless adventures along the way. 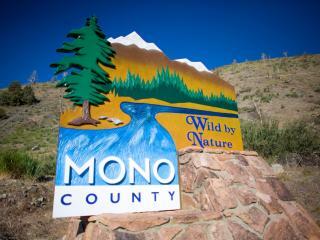 Heading from Southern California on the way to Mono County, travelers can encounter a range of experiences. Lowest Point: Death Valley, 282 feet below sea level. Death Valley National Park is the lowest, driest and hottest place in North America with summer temperatures that can hit 130 degrees Fahrenheit – but it’s a beautiful place to visit with interesting features from Dante’s View and Artist’s Drive to the Racetrack, a series of stones that leave tracks across the desert. Highest Point: Mt. Whitney, 14,505 feet above sea level. While only the hardiest, most determined hikers will want to obtain permits for the strenuous 22-mile hike to the top and back, everybody can enjoy views of the peak from Lone Pine with a scenic drive through the Alabama Hills below. Stop in at the Eastern Sierra Interagency Visitor Center in Lone Pine for information, permits and directions. Oldest Trees: Bristlecone Pines, White Mountains. Drive up Highway 168 east of Big Pine to White Mountain Road and you’ll find the Schulman Grove Visitor Center, with short and long walks through trees that are thousands of years old, including the world’s oldest living thing – a tree that has lived 5,064 years! Highest paved road in California: Rock Creek Road, 10,250 feet above sea level. This scenic drive that departs US Highway 395 at Tom’s Place brings sightseers to high alpine lakes and hiking trails and under the shark-tooth granite peaks of the Sierra Crest - particularly gorgeous during the fall color season. Highest you can get without breaking a sweat: Mammoth Mountain Gondola, 11,060 feet above sea level. Take the Gondola to the top of the mountain and it will feel like the top of the world with panoramic views across the Sierra, including the jagged Minarets. Youngest Mountains: The Mono Craters, Mono Basin, stretching 10 miles south of Mono Lake, are the youngest volcanic mountains in North America, with the most recent eruption less than 700 years ago (Panum Crater). Accessed by California Highway 120 East off US Highway 395 south of Lee Vining. Rare geologic wonder: Devils Post Pile, protected in 1911 as the Devils Postpile National Monument, is a unique the unique, 60-foot columnar basalt formation offers a stunning glimpse into geology. The columns are strikingly symmetric, formed by cooling lava. Highest Sierra Pass Road: Tioga Pass, 9,943 feet above sea level. This famous route takes sightseers from Mono County to Yosemite National Park through dramatic stunning mountain scenery, with many options for hikes, fishing, picnics or other roadside diversions both inside and outside the National Park’s eastern entrance. Seventh saltiest body of water in the world: Mono Lake, Lee Vining. This otherworldly body of water, with its remarkable tufa towers and unique wildlife is also home to the second largest colony of California Gulls during nesting and breeding. Visit the South Tufa State Reserve just off Highway 120 East, and stroll down the boardwalk to the shoreline with the lake’s most distinctive and photogenic tufa formations. Top-ranked, must-see ghost town: Bodie. The nation’s largest unrestored ghost town, Bodie State Historic Park, is a journey back into the Old West’s colorful gold rush history. Located between Mono Lake and Bridgeport, the town’s abandoned buildings include a Methodist church, school house, hotel, saloon (one of 60 that were open in Bodie’s heyday) jail, general store, numerous homes, barber shop and a stamp mill - all preserved in a state of arrested decay. At its peak, Bodie had a boomtown population of 10,000 residents. Located approximately 315 miles north of Los Angeles, and 280 miles east of San Francisco, Mono County accesses the east entrance to Yosemite National Park and beckons visitors in all seasons. Whether taking advantage of convenient direct flights on Alaska or United Airlines from Los Angeles International Airport (LAX), San Diego (SAN), San Francisco (SFO) and Denver (DEN) to Mammoth Yosemite Airport (MMH), or arriving by car on the all-weather US Highway 395, the Eastern Sierra’s vast playground is an easily reached destination. US Highway 395, which traverses Mono County from north to south, is a State Designated Scenic Byway offering motorists tremendous vistas right from the steering wheel and countless side-roads, hiking trails, lakes, and roadside villages to explore. For more information or to request guides, visit MonoCounty.org or call 800-845-7922.